Doorways are ready for doors now. Pictured above is the view looking into the hallway. Below Jim West and Jack Coyner survey their handiwork. Things must've gotten too quiet for Jim, the project manager for the current phase of depot interior restoration. Thinking he'd spent too many weekends at home in Coeur d'Alene, he once again opted to spend his weekend pounding nails in Potlatch! Wrangling Jack into helping --or at least offering moral support --Jim tackled the door openings between the hallway and the freight room. In a candid moment, Jim admitted that he figured this would be a quick job, but as often happens in 100-year-old buildings, the construction wasn't quite predictable. He'll have to explain it more in detail to those interested enough to ask, but suffice it to say, the quick job turned into a couple of days of measuring, sawing, pounding---and sometimes ripping out! Thanks Jim for staying with the project. Now, any volunteers ready to hang the beautiful doors that were salvaged from the Genesee School? Things will look great once these doors are in place. 10-year anniversary, which was celebrated during Potlatch Days in July. 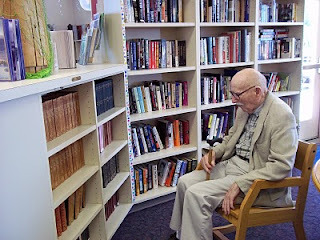 *Recently HPG Secretary Barb Coyner had a chance to interview Malcolm Renfrew, well-known chemist and University of Idaho professor emeritus. Malcolm grew up in Potlatch and has always treasured his roots in the company town, as shown by the generous donation he sent earlier this year for the depot restoration project. The following interview appears in the current Potlatch Historical Society newsletter. Malcolm Renfrew was young when Potlatch was young. The City of Potlatch celebrated its centennial in 2005, and Malcolm will celebrate his 100th birthday on October 12, 2010. In the meantime, the retired University of Idaho professor hasn’t forgotten his roots. He was and still is a Potlatch boy at heart. Born in Spokane, Malcolm MacKenzie Renfrew moved with his family to Potlatch in 1923 after the Potlatch Mercantile recruited his father to work in the renowned company store. “When my father was offered the job, the Merc was the merchandising marvel of the times,” Malcolm recalls, noting that the semi-annual sales brought people from all over the region to Potlatch to shop. Malcolm’s dad enjoyed a certain amount of prestige in town, serving on the three-man school board with Allison Laird and Walter Humiston, both Potlatch Lumber Company executives. Malcolm clearly remembers the day he and his brother Edgar moved with their mother by train from Colfax to Potlatch. The train excursion itself proved an adventure for Malcolm, 12, and Edgar, 7, as their mom navigated the different rail lines, finally boarding the WI&M at Palouse. One big change for the boys at Potlatch was the library. 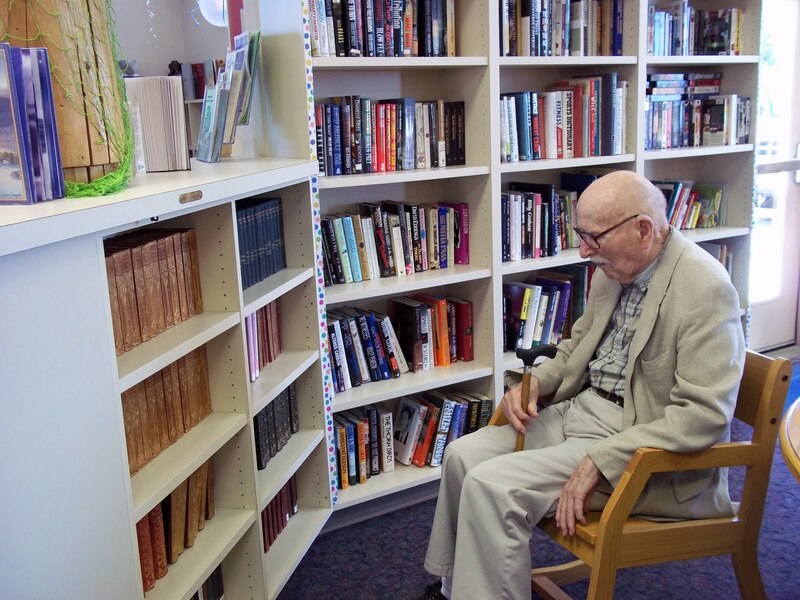 “There was no library in Colfax, so this was the first library I’d been in and it was full of good books,” Malcolm recalls. The Renfrew parents placed a big priority on their sons attending college and saved for it. After graduating from Potlatch High School, Malcolm attended the University of Idaho. The college president was of the opinion that students should explore different classes in their first two years before deciding on a major. That was fine with Malcolm and he enjoyed the class variety, finally settling on chemistry because a favorite uncle had graduated from Washington State College with a degree in chemistry. Edgar chose physics, although he eventually got into analytical chemistry. While at college, Malcolm was coaxed by fraternity members from WSC and UI to introduce them to the resident bootlegger in Onaway, hoping that Malcolm could also confirm that the guy wasn’t a federal agent. In 1932, Malcolm earned a Bachelors of Science Degree, and finished a Masters Degree in 1934, eventually earning a PhD from the University of Minnesota in 1938. He also married Carol Campbell of Rosalia in 1938. His earliest career was with DuPont, where he was credited with helping in the development of Teflon. Malcolm clarifies that he made a speech on behalf of DuPont when Teflon was unveiled and ever since, many have erroneously credited him as being the inventor of the famed non-stick substance. He does, however, have a patent for developing a manufacturing process for Teflon. Malcolm and Carol spent a great deal of time in New Jersey during his career. But he never forgot his Idaho roots, admitting that he and Carol stayed up each New Year’s Eve until it was officially the new year in Idaho before going to bed. When the chance came to join the faculty at UI, Renfrew gladly headed west. “I felt being at the University of Idaho was the ideal job,” he says now. The feeling must’ve been mutual because the UI eventually named a science building after him. In his nearly 100 years, Malcolm Renfrew has traveled the globe and lived life to the fullest. His wife Carol passed away in January and his brother Edgar died in April, and these days he resides at Good Samaritan Village in Moscow. Clearly there is still a strong interest in talking about the place that shaped so much of his life—Potlatch, Idaho. Malcolm is the guy who recruited me to Idaho - I hope I have repaid it a bit. I have a little story about that, probably mostly on me, but thought you might enjoy. I applied to about a half-dozen grad schools my senior year at Wilmington College (Ohio), and received offers from all. I applied to Idaho becaue my advisor at WC was also a U of I grad and knew Malcolm, and recommended it. AS the year went on, by close to the deadline I had narrowed the field to U of I and Rice University in Houston (a pretty prestigious school, if I do say). Both offers were about equal, and I had to make a decision. On a Saturday I was sitting around my dorm room trying to, and was paged for a phone call. It was Malcolm - head of the department at U of I. He talked me into Idaho - mainly because he cared enough to make the personal contact. About a month later, Malcolm was attending an American Chemical Society conference in Pittsburgh, PA, which coincided with our spring break, and I was visiting a then-girlfriend who lived in Pittsburgh. We set up to have breakfast at one of the downtown hotels. All sorts of images of this 'Mountain Man' from Idaho came to mind - maybe some giant of a man who would come in and order half-a-dozen eggs, ham, bacon & sausage, potatoes - you get the drift. Well, you know Malcolm and can envision how out of kilter that vision was from the real man - a 'two poached egg' guy. But he was a neat guy, and I was glad of my decision. By the time I arrived in August, Malcolm had gone on a year sabbatical, so Elmer Raunio was interim department head. I was fortuunate to get out of town with my MS at the end of August and into the Bureau in September - but didn't get to see him again until years later when I visited U of I doing research for WPR.